Western Immoren, Upper Wyrmwall mountins. 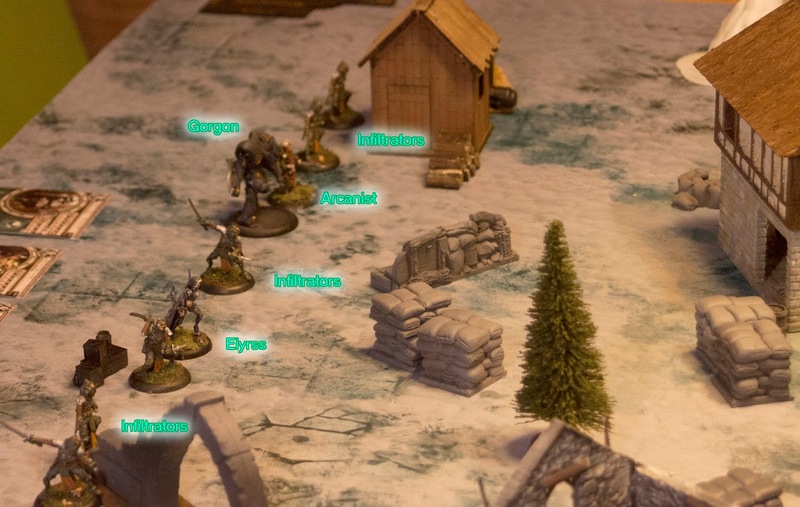 After contact with previous patrol was lost, Eiyrss gathers a band of Infiltrators and a Gorgon for support and heads for the snowy landscape to recover a vital piece of intel. Between remains of an old mining village, they come upon some Cygnarian trencher commandos. It seams, they were the ones that ambushed previous patrol. Showdown between special forces commence. In this scenario attacker (Retribution) has priority (initiative) in the first round. 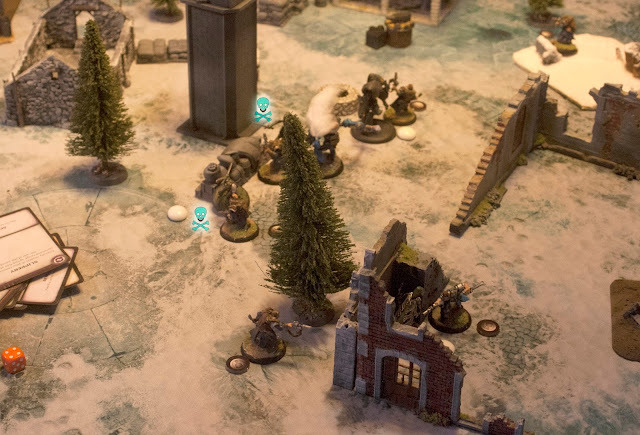 Defender puts three objectives in his deployment zone, and at the beginning of the attacker`s first round, attacker rolls a d3 and the number rolled decide which one of the markers will stay in play. At the beginning of first round we found out that intel we are seeking is under objective marker 3. Grenadier was advance deployed. 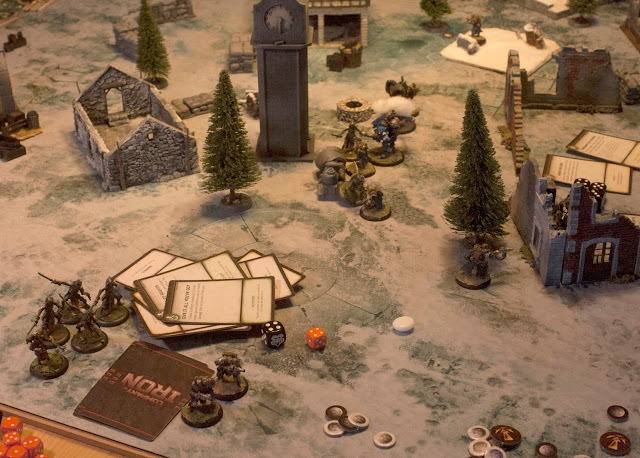 With priority, Retribution force started to run towards Cygnar lines. Brave commandos didn't want to wait for enemy to come close, but run towards them. Single commando made an assault on approaching enemy on Cygnar right wing, but his aim was astray. Grenadier run forward with two commandos and opened fire on closest infiltrator, but all three hits missed, apart from the third which clipped one other infiltrator and knocked it down. Retribution player used Rallying call card, so the knocked down infiltrator automatically stood up, and had his activation. One of infiltrators even reached one of the commandos. With his last activation Retribution player activated Eiyrss and she shot the Grenadier for 4 points of damage. Second round begun with Retribution priority again. Infiltrator on the left Retribution flank charged the Sketterguner and got him injured (he did not survive). 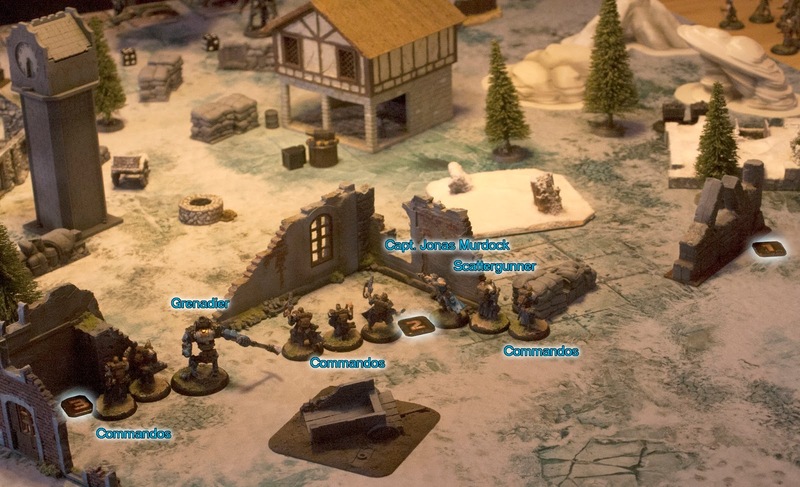 Commando in the snow drift charged other infiltrator on the same flank and put him out of action. With left flank activated, retribution player turned his attention to the brawl in the middle. Both Eiyrss and Gorgon took aim on Grenadier and he was left with only two point left (right hand and cortex). In exchange fire Gorgon was stripped of his polarity field, but Arcanist quickly repaired him. Both sides added men to the brawl behind the clock tower, some of them got injured and one from both sides died. Beginning of the third round saw Cygnar have priority for the first time. Lone commando on Cygnar right flank charged and killed last Infiltrator on that flank. Eiyrss charged a commando behind the well, knocked him down and used her ability Quick work to put a shot in the Grenadier and finish him. Brawl behind the tower clock continued, and one Infiltrator fell as a victim of it. Most of the participants of this brawl were injured or knock down at this moment. With the beginning of the forth round the priority get beck to Retribution. Retribution player realized that it was his last chance to grab objective, so Eiyrss run straight to it. 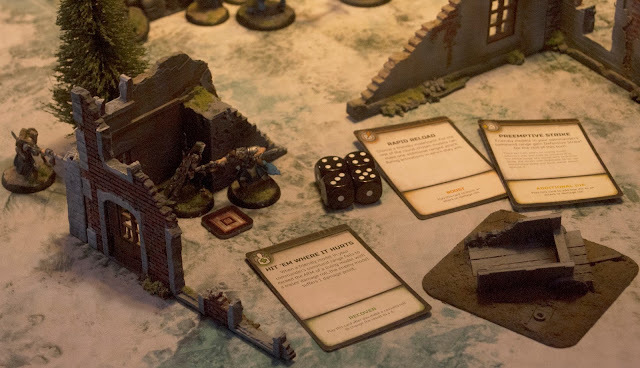 One of the commandos broke out of the brawl below clock tower and threw a grenade through the window straight on the Eiyrss (with Death to rights card active and additional die card played commando overcame Eiyrss` defense of 20). Eyriss was stripped of all her wounds, but was not injured because Retribution player played recover card. With Defiant zeal card active for this Retribution turn, Eiyrss was not even knock down. Capt Murdock charged Eiyrss too, but missed with all of his attack. In the battle below the clock tower one Infiltrator and Arcanist died. At this moment whole game hanged on one last roll for priority. 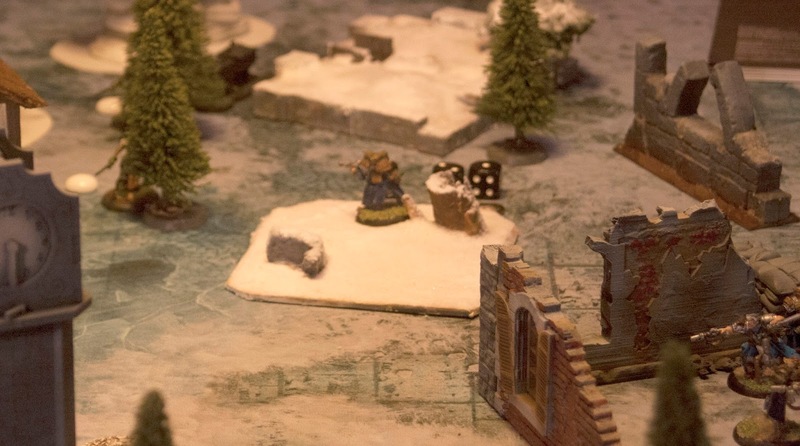 Cygnar player won this roll end got an opportunity to finish Eiyrss before she can take vital intel from the objective. Capt Murdock used both additional dice and boost and his attack beat the Eiyrss` defense of 18 at that moment. She rolled casualty roll and got 2 - dead, but Retribution player played a Recover card to make her just knock down. 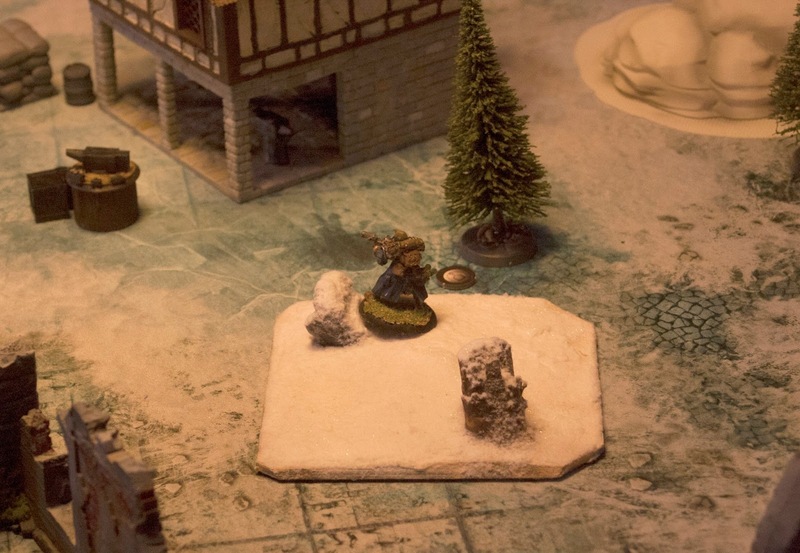 It was Retribution player`s turn, so Eiyrss stood up, and used her action to take information from the objective. This was my sons and mine first game of Company of iron. 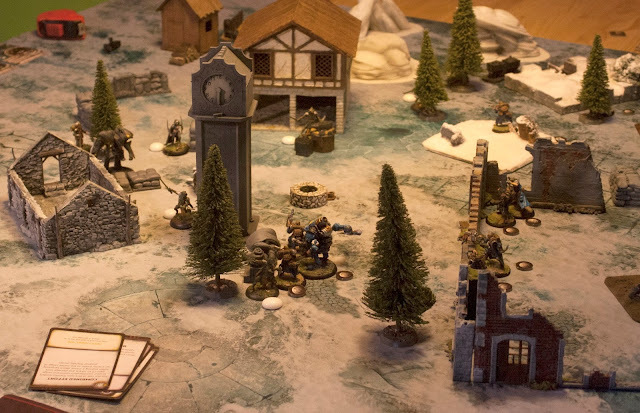 I was very eager to play this game, because I lately loose appetite to play Warmachine, and I still love the setting. CoI did not disappoint me. Small scale, man to man combat, with the twist of the combat cards, are just what was prescribed to reinvigorate interest into Iron Kingdoms. The cards are the ones that make heroic deeds possible, and they mitigate luck of the dice rolls at least partially. 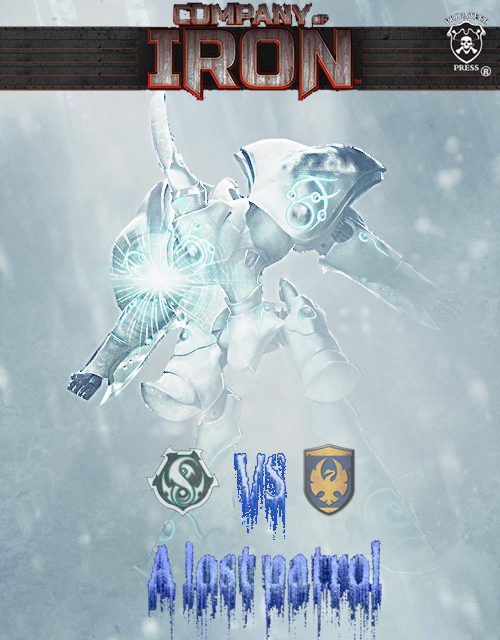 I'm looking forward to playing Company of Iron more, and possibly combine it with Warmachine scenario play. Yes, you are right, we get it wrong at the time. Really lovely photo editing here- looking forward to reading more!